D&M Guitars is veteran technician and luthier Daniel Murphy. Daniel started in 1982 as Boston legend John Butcher’s guitar tech, working live shows and on his seminal albums “Along the Axis”, and “Wishes”, as well as touring in support of those records. 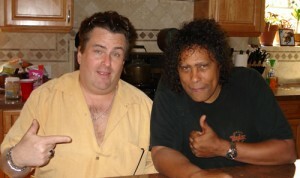 The early 80’s also found Daniel working numerous “one off” shows with Aerosmith. 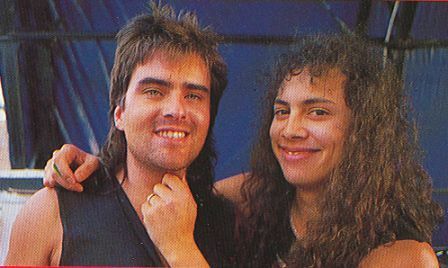 In 1986, Daniel was hired by Metallica to be legendary Metal guitarist Kirk Hammett’s touring tech. Daniel spent the next 5 years touring endlessly with Kirk and Metallica in support of their albums “Master of Puppets”, “$5.98 EP”, and “And Justice For All”. In between Metallica tours in those years, Daniel worked for Ian Hill, bassist for Judas Priest (on the 1993 “Pain Killer” tour) and worked club tours with everyone from Grim Reaper to Ricky Lee Jones and The Northern Pikes (Canadian multi Juno Award winners). Aaron Andersen – guitar player/pedal steel whose credits include Christina Aguilera, Kate Earl, Crystal Lewis, Ben Cantelon and OneRepublic. Daniel then took some time off from the music business to focus on his young family. In 2004, Daniel attended Brian Galloup’s School of Lutherie in Big Rapids Michigan. Daniel learned the “math” of guitar construction and design there and started D&M Guitars, a business focused on the setup, repair, and custom building & restoration of stringed instruments. In 2008 Daniel went back on the road, doing short stints with various artists including Third Eye Blind, The Deftones, Jay Z, Rob Thomas, and Matchbox 20 among others. In 2011 Daniel was hired by Matchbox Twenty to be the Tech for bassist Brian “Pookie” Yale on their world tour beginning that year. Daniel’s luthier skills were put to use by all band members. The tour lasted into 2012, with an especially fun co-headlining summer segment featuring MB20 and the Goo Goo Dolls. Dan’s focus is and always has been on timely, affordable setups and repairs, with a quick turnaround. In 2014, Daniel celebrated the 10th anniversary of D&M Guitars, recognizing a decade of serving professional and amateur players of stringed instruments of all types.